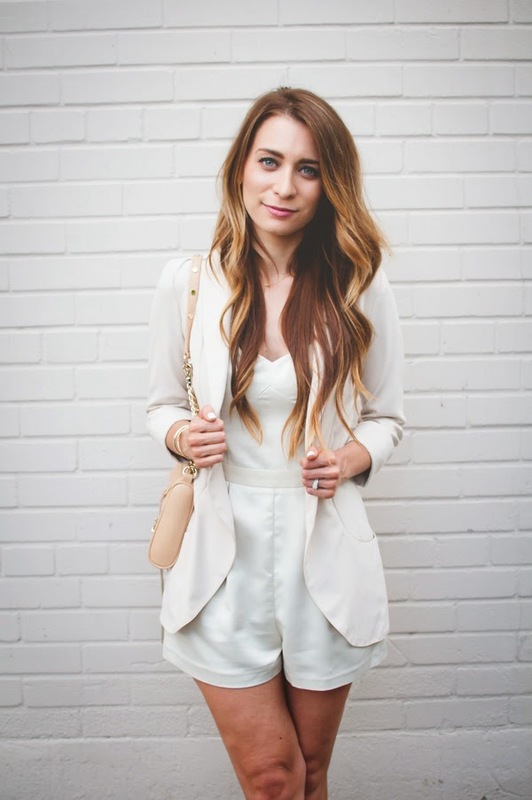 OOTD - White on White Monochromatic | La Petite Noob | A Toronto-Based Fashion and Lifestyle Blog. This romper was a major score from the Top Shop sale, thats still going on now. Admittedly, it may look nicer once I get some colour but I like how it pairs with a blazer. What do you think of the white-on-white, monochromatic trend? Thanks Tatianna! I have a secret obsession with Kim K. so your comment totally made my day ;) I think all white would look great on you now! Your romper is so cute! I'm not big into the white on white trend, but you look lovely in it. This romper is everything, you look gorgeous. I love monochromatic outfits -- I think they tend to be slightly more bold than incorporating a ton of colors at once. Also, I am all about oversized blazers right now. Me too! I think an oversized blazer is so shape-flattering, I love it! Joelle, I am so in love with this monochromatic look to the point where I could literally just buy all these pieces to re-create it. It is so chic!! Thank you Lauren, I'm glad that you like it! Happy 4th of July!